Officers were on scene at Ipsley Pool, Redditch after receiving a call to help fish in distress from Redditch Borough Council. The Environment Agency believes natural causes have contributed to a drop in the amount of dissolved oxygen in the pool, making it difficult for fish to breathe. To help, officers immediately called for specialist equipment to aerate the water and bring up the oxygen levels. They are also checking the upstream watercourse to completely rule out pollution as the cause of the incident. 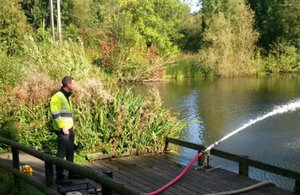 Environment Agency fisheries staff have been working with Redditch Borough Council, the owners of the pool, to advise them on what to do if this happens again. We are on duty 24 hours a day to respond to fish kills and fish in distress. Because of this we could respond quickly, which has reduced the impact on the fish. We’ve been working with Redditch Borough Council and at the end of the day today we’re handing this incident back to them to take forward. If anyone spots fish in distress in any river or waterway, then please call our incident helpline on 0800 80 70 60. Protecting fish and water wildlife is part of the Environment Agency’s fisheries management role. Their teams are trained to use aeration equipment or hydrogen peroxide to restore dissolved oxygen levels.